It pointed to a Pew Research study Parents’ Time with Kids More Rewarding Than Paid Work — and More Exhausting and the Pew study had a chart showing the number of hours that parents spend in leisure, childcare, paid work and housework in a week. Dads spend 3 hours more a week in leisure time and Moms spend 7 hours more doing childcare. So you could conclude like the Slate article did that men dump the kids on mom to go watch the NFL. 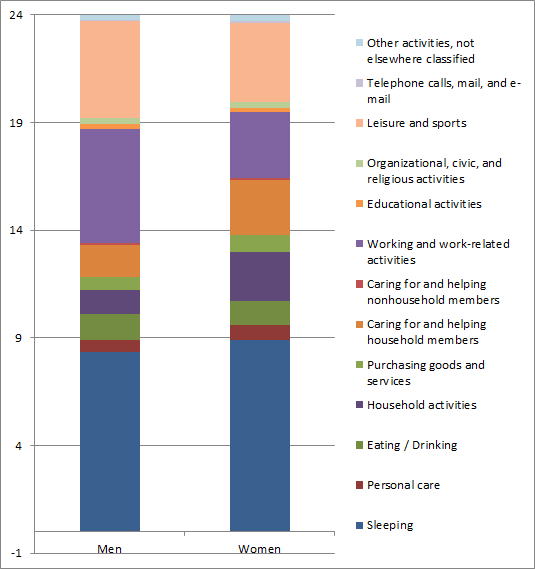 Clearly Dads are enjoying more leisure and Moms are doing more childcare. But does that mean that Dads are watching TV *instead of* or at the expense of childcare? 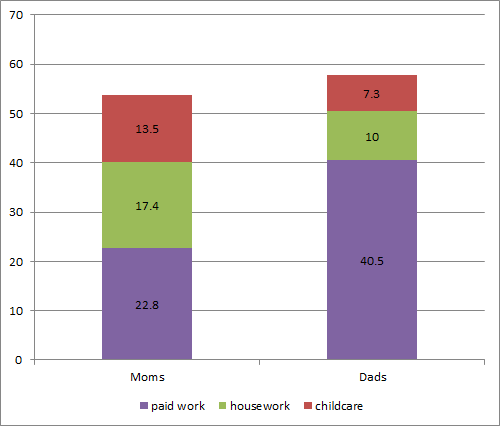 You'll notice that Dads do a lot more paid work than moms and moms do more housework than dads. It just seems unfair that Dads have 3 hours more of leisure time doesn't it? If you add it up Dads spend a total of 57.8 hours doing paid work, housework and childcare and Moms spend 53.7 hours in those tasks. I could stop there and make the kind of conclusion the Slate article made and declare that Dads do 4 hours more work in home and out of home than Moms in a given week. But that would. be unfair as concluding that Dads ignore the kids to watch football. You might notice that the hours in question don't add up to a full week. The total for the 4 activities is 78.2 hours for Moms and 85.3 hours for dads which averages out to 11.2 hr and 12.2 hr daily for Moms and Dads respectively. So we're only looking at about 1/2 of the total hours in a week here. I am not going to assume people sleep 12 hours a day. Where is the rest of the time going?? To get the real answers you have to go to the actual source of the data. In this case the Pew Research "study" simply got the numbers from the BLS ATUS or American Time Use Survey. Ahh... good old BLS. Not even shutdown during the shutdown. I'm honestly not sure where the Pew Research study got its numbers. They say they used the 2010 data on the BLS ATUS but I can't find ATUS figures for 2010 that match exactly what Pew said. I am probably just not finding the right table on the BLS so I'm not worried about that. 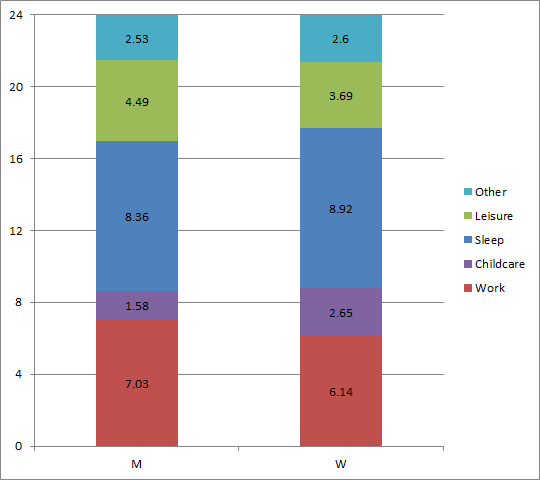 In any case, I did find the BLS ATUS figures for 2012 that break down daily time use for parents and compare moms and dads. Personally I find it hard to believe that people average that much sleep. Women spend 0.56 hrs more sleeping. Women also spend 0.23 hr more purchasing goods and services, most of which is grocery shopping. Personally I'd put grocery shopping in the household activities but I guess since it isn't actually IN the household they figure it separate. Women spend 0.12 more on personal care. Then the differences in other categories amount to only about 5 minutes of a given day. The combined time spent in the work category and the childcare categories are pretty close to equal between moms and dads. When you add it up Moms spend about 11 minutes more in an average day on work and household and childcare than Dads do. The other time is divided up between sleep, leisure and other stuff. Note this is all for households with children under age 6. When kids get older then parents spend less time on childcare and more time divided up elsewhere. 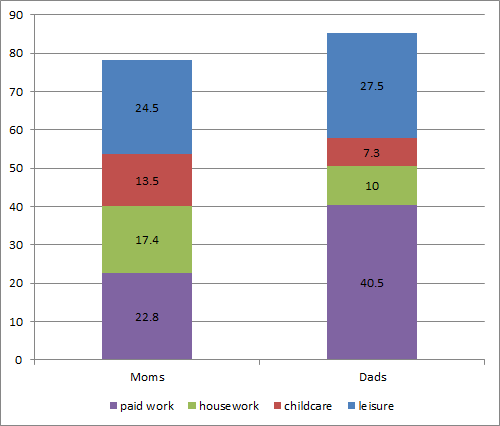 Edit: There is also a more detailed report on how parents spend their time on BLS : Time use of working parents: a visual essay It dices the numbers some more. One interesting point it has is about secondary child care which means watching the kid in addition to another activity. For example if you're watching TV while keeping an eye on your kid at the same time.